Happy Friday, everyone! I hope you have amazing plans for your Saturday and Sunday. Can you believe it’s the end of February already? I am now exactly one month out from beginning my yoga teacher training! Was just gifted this and am so filled with gratitude. Get inspiration for your next micro-adventure here. Do you have an awesome yoga bio? If not, check this out for guidance. This article on stepping away from your routine and how that feels. 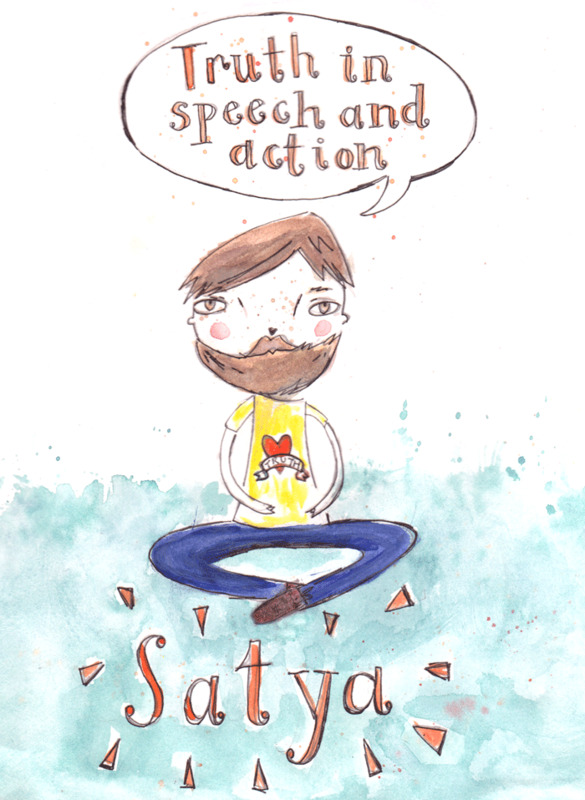 Keeping in the theme of focusing on Satya…this article. When I was a kid, I used to love make-believe. I would pretend to be someone else in my head, even as I was going through my daily routine. Call it escapism or daydreaming, but I would sometimes spend long car rides developing another alternate story to my existence. 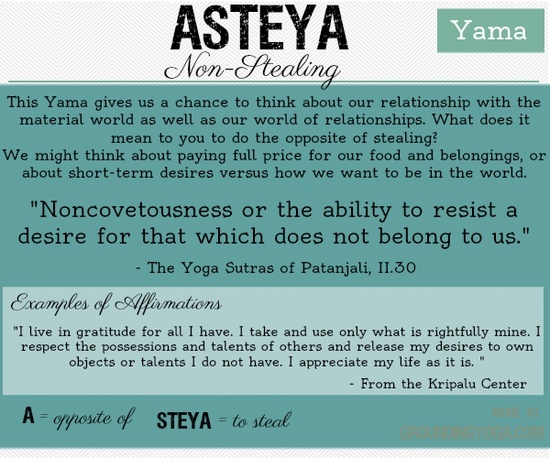 Enter my deeper dive into Satya, the second of the yamas, as a thirty-something year old. Satya refers to truthfulness or the absence of falsehood. Ahem, so I can no longer pretend to be something I’m not. Alas, no longer can I pretend to be an astronaut awaiting her next mission to space. Bummer. Instead, I get to be truthful with myself and with others. I am in fact realizing that this is a much cooler way to rock out my life. By first being honest with myself – about my emotional state, mental state, physical state and spiritual state – it allows me to be much more honest with others about how I’m feeling, processing and reacting to things. Groovy. It makes total sense to me that Satya would follow Ahimsa. Think about it, if we are able to love ourselves, fully and completely and just as we are, there is no reason to pretend to be anything other than that person we fully love. If we love others, fully and completely, just as they are, then there is no reason to pretend in our relationships to others. No doubt about it…Satya can be hard sometimes. This past week, I had the opportunity to go to a speaker series regarding mountain winter safety. One of the speakers noted that oftentimes, the main reason people find themselves in unsafe situations is because they haven’t been honest with themselves about their skills, knowledge and abilities whether mountain climbing, skiing, hiking or pursuing other outdoor activities. As such, people can find themselves in some gnarly situations involving hypothermia, broken limbs, falling into crevasses or perched on a mountain ridge unable to move due to lack of situational awareness. If, instead, these individuals were honest about their skill level and were able to be honest with themselves and others about their abilities, they might not find themselves being chased down a mountain by a wild animal just out of hibernation. So, why are we so drawn to not telling the truth or being honest with ourselves? Is it human nature to lie? I think there are many reasons we stretch the truth. Pride, embarrassment, lack of understanding and wanting to prove something to not only ourselves, but to others as well. We lie to others to save people from getting hurt, to impress and to, in some cases, be better than. All of these motivations, however, can create a nasty web through which we have to weave and bob. It takes up energy and time to create the lie and then to maintain that lie moving forward, no matter how large or small. The real revelation here is that all that time and energy could be used for something else. Not only that, a lie is a lie…there is no relativity in it. I’ve been pondering my imaginations as a child and exploring my motivations for them in order to better understand how I have come to the honest place about where I want to be in my life now. While childhood daydreams aren’t necessarily lies that have negative motivations, they do serve as a jumping off point for my personal exploration of Satya and how it might be manifesting itself in my daily life as an adult…even on the mat when I am pushing myself beyond a point of comfort because I am enforcing a perceived notion of what I should be capable of, despite my body and mind telling me I’m not. Be honest. Be sincere. And, most importantly, always remember these are works in progress. I am currently transfixed by the Yamas. Five “ethical standards” through which we can live our lives in better and more fulfilling ways. By realizing these Yamas, we have the ability to treat ourselves and others with the respect we all deserve, and subsequently prepare ourselves for our Asana practice on the mat. The first Yama is Ahisma. Ahisma, very simply translated, means “nonviolence.” Now, not only does this mean nonviolence toward other living, sentient beings. In my mind, it also means nonviolence towards oneself. All these posts about “loving yourself” are attempting to get at just that. Think about friends or family who have gone through difficult times in their lives. Oftentimes, I hear people struggle through challenging moments in their lives by engaging in negative self-talk. Talk that situates blame for being in the current position squarely on the shoulders of the person doing the talking. I find that in these challenging moments, it is of the utmost importance to practice the greatest and most fierce acts of self-love in order to fully express what we need and when we need it. If you are struggling and feeling alone and a hug from someone would make you feel better, is it not easier to ask for the hug rather than berate yourself for needing that hug in the first place? I think so! Ahisma is not just negative self-talk. It can also mean engaging in negative behaviours we use to compensate for the negativity we are feeling inside. By not treating ourselves with love mentally, physically and emotionally, we are not setting ourselves up to better serve others mentally, physically and emotionally. Not only that, by neglecting or punishing ourselves, we prohibit our abilities to practice Ahisma to others in our lives. How do you practice Ahisma when it comes to yourself? To others? How do you connect this Yama to your practice on the mat?